← What did you do Friday night? 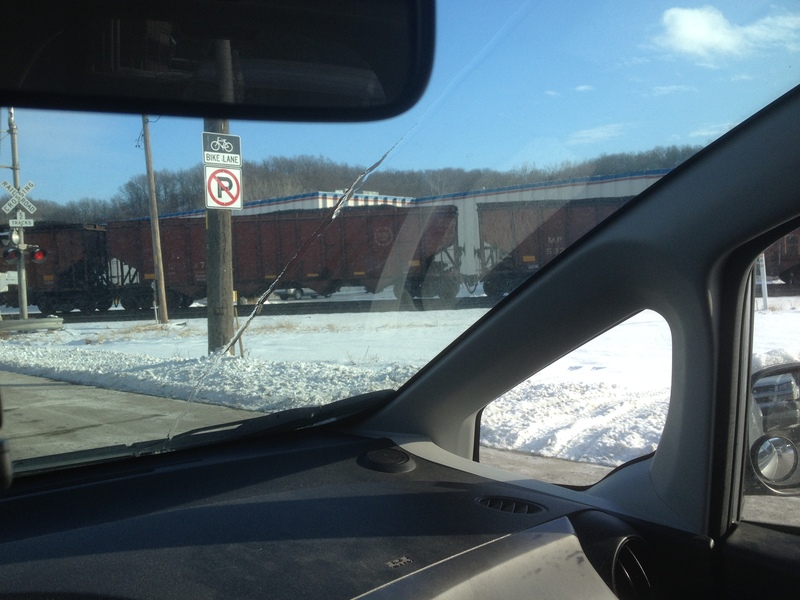 Is this a familiar scene on your way to or from Rainbow Mennonite Church? It is for me. When we were looking for a house in Rosedale I told Jesse that I didn’t want a train track to separate our home from our church. I got over it and it’s been fine for the most part. In fact, the last few times I’ve been stuck by a train on my way to church I’ve been less prone to curse and pound the steering wheel. That’s because all I have to do is remember Richard Friesen (pictured here with his wife Dorothy) standing under I-35 with a clipboard and stopwatch in hand counting how long the train blocked Southwest Boulevard. Let me explain: Richard and Dorothy moved to Rosedale in 1974 and stayed about 10 years. 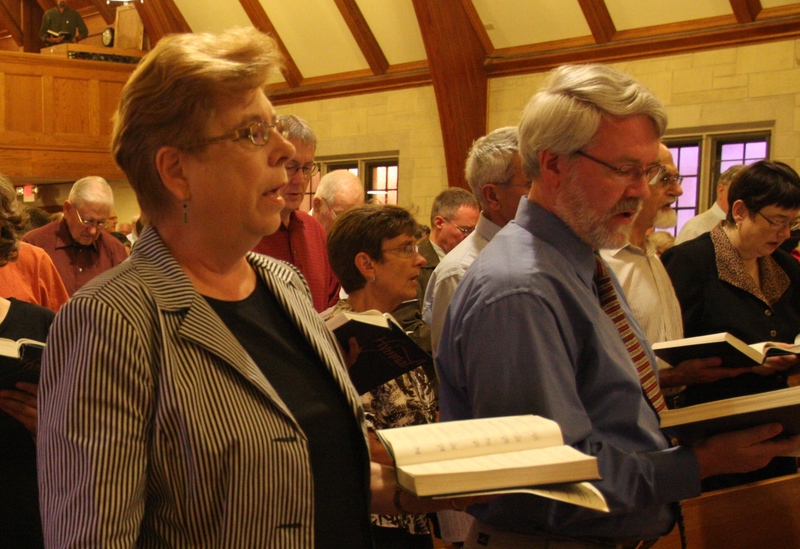 Rosedale Team Ministry, to which Rainbow belonged, pretty much hired Richard and Dorothy to, in his words, “live in the community and get to know it.” Dorothy was hired by Crosslines to teach in their Alternative School in the original Rainbow church building. 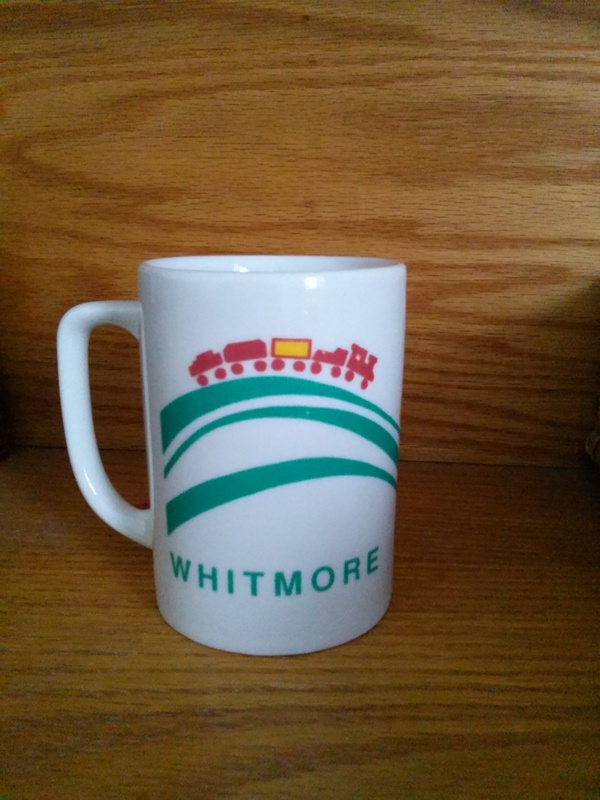 The Rosedale Team Ministry churches had purchased the Whitmore School site and so one of Richard’s responsibilities was to find the resources to build the Whitmore playground. He was also the instigator, together with neighborhood groups, of what became known as The Rosedale Train Watchers and Waiters. Imagine, Richard told me, a time when parked trains would block Southwest Boulevard, for 45+ minutes! Then, imagine what happens when someone needs medical care or imagine when there is a house fire. In other words, people were cut off from these important services due to these long train waits. Like any good community organizer, Richard started reading city ordinances and discovered that a misdemeanor could be filed if a city road was blocked for more than five minutes. Off to the court house he went (this happened several times after several failed attempts). Furthermore, like all good neighborhood groups, people got creative and started to host potlucks. The thing is these potlucks were held under I-35! Neighborhood residents took turns and stayed there for 24 hour periods, holding stopwatches and clipboards, jotting down violations. Plus, what better time to get people to sign petitions than when they are sitting in their vehicles waiting for the train to go away?! “The media loved this stuff,” said Richard, especially since they had posters, mugs and t-shirts that said things like “Give the trains a kick in the caboose!” It was a classic David vs. Goliath story and so Richard and his friends were sure to invite these media folks to their 24 hour long potlucks and campouts. One of these friends and fellow community organizers was our very own Terry Rouse. Terry remembers taking a shift in a camper parked down by the railroad tracks as they timed the trains one weekend. Terry says that there used to be a switching yard just North of the crossing and so trains would often pull all the way across then stop and slowly back up as they were switching tracks in the yard. Richard wonders how much good their protests did immediately or even long-term. Then again, the delays crossing the tracks pale compared to what they were years ago. And thank goodness there is a way for emergency vehicles to get to the area around Rainbow without fear of trains slowing them down. Furthermore, Terry has heard that the efforts of the Rosedale Train Watchers and Waiters created enough of a headache that when the Frisco and Burlington Northern merged and they were consolidating their infrastructure, they chose to move their switching to another yard. I hope that yard was close to a neighborhood with caboose-kicking community organizers like Richard and Terry! 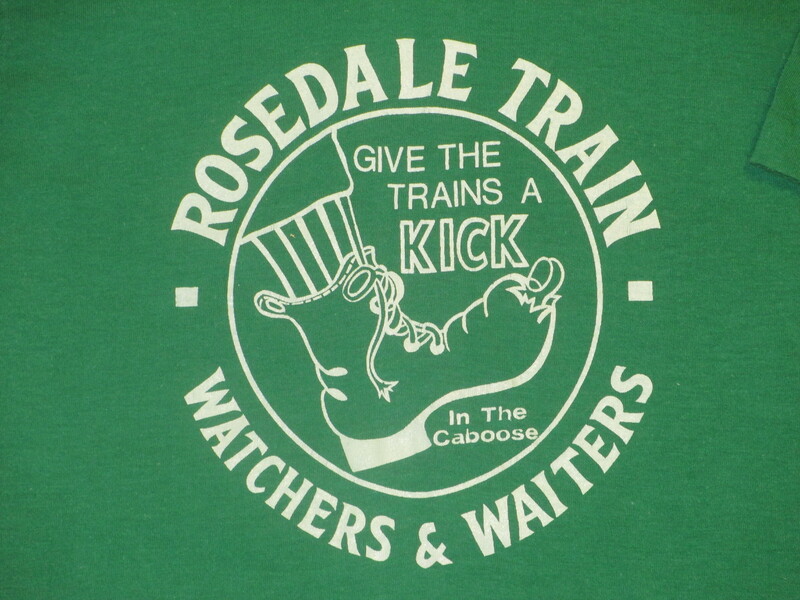 I’m on the look-out for pictures of the Rosedale Train Watchers and Waiters. Can anyone help? For now, I’ll include this photo of our Rainbow mugs. Did you ever wonder why a train was included?